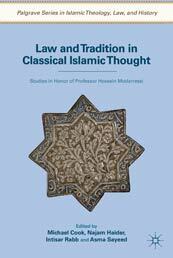 This January, Plagrave Macmillan Publishing will publish Law and Tradition in Classical Islamic Though: Studies in Honor of Professor Hossein Modarressi edited by Michael Cook (Princeton University), Najam Haider (Barnard College), Intisar Rabb (New York University School of Law), and Asma Sayeed (University of California, Los Angeles). The publisher’s description follows. This collection brings together the work of some of the most prominent legal scholars and historians of Islam. The assembled articles cover a wide range of issues from debates over the Qur’anic text and issues of law to vibrant intellectual exchanges in philosophy and history. Taken together, these articles develop key inquiries surrounding Islamic law and tradition in unique ways. They also exemplify a critical development in the field of Islamic Studies over the last few decades: the proliferation of methodological approaches that employ a broad variety of sources to analyze social and political developments in classical Islam.